Texas Housewife: Migraines Are Yucky! Mema is so smart. She told me at lunch yesterday that the weird flashed I was seeing before my eyes at lunch yesterday were probably migraine related. I kinda blew it off, as I've not had a migraine in years and thought my eyes were being weird. By the time we finished lunch, the right side of my head had started bothering me. After the 5 minutes drive home, the vomiting started. Then worse pain than I've ever experienced. I've been told that I babbled and talked about what funeral home I wanted to go to and said "kill me" and "help" me over and over. This was obviously not my best moment as a Mom! I tried hot, then cold compresses. I took pills, we tried massage, but nothing worked. I drifted in and out of consciousness. I was laid out on the sofa, miserable, and incoherent. It finally stopped, around 3am this morning! I've not been so miserable in years! So, do any of y'all have these awful headaches? If so, what do you do for them? 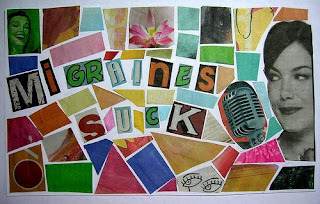 i get migraines once in a great while and keep excedrin migraine around in these instances. that plus a cold cloth on my head, and i feel much better.